If you are at high risk for heart disease or have a symptom such as shortness of breath or discomfort in your chest, your doctor may order certain heart tests. But there's more to testing than simply finding out if you have heart disease. Your doctor may also want to determine whether the fatty plaques inside your blood vessels pose a high, medium, or low risk for a heart attack. The answer will help determine whether you need treatment, and if so, which type of treatment will be best. No single test is better than another, and no test is appropriate for everyone. "The best test for an individual is the one that provides the information needed to guide management," says Dr. Ron Blankstein, a cardiovascular imaging specialist at Harvard-affiliated Brigham and Women's Hospital. A nuclear stress test shows areas of heart muscle that receive good blood flow at rest [A], but are starved of blood during exercise [B], due to insufficient blood flow. What's the right heart test for you? There's a good chance your first test will be noninvasive. This means it may be possible to obtain information without inserting needles or tubes into your body. "We usually start with the least complex and least expensive test, and go from there," says Dr. Marcelo Di Carli, director of the cardiovascular imaging program at Brigham and Women's. A treadmill stress test is often the first test performed. You'll walk at a brisk pace on a treadmill that's slowly inclined to offer more resistance. This gets your heart pumping harder and faster. As you walk, an electrocardiograph measures your heart rate and the electrical activity in your heart, and your blood pressure is recorded periodically. A person who cannot walk on a treadmill will be given a drug to mimic the effects of exercise. How will the test results affect my treatment? Does the test require any special preparations? Do I need to stop taking any medications or food before the test? The stress test may be combined with echocardiography, a nuclear perfusion study, or magnetic resonance imaging (MRI) to determine whether a flow-limiting blockage is present (see "Stress imaging studies explained" on page 7). These tests reveal how much of the heart muscle is affected by poor blood flow when challenged. An echocardiogram may also show an area of heart muscle that is impaired and not contracting normally after exercise. Nuclear studies and MRI can reveal which parts of the heart are receiving low blood flow, indicating an obstructed artery. Since most older people have some degree of artery narrowing caused by coronary artery disease (atherosclerosis), the question is whether the narrowings interfere with blood supply to the heart muscle. If they do, attempts to reduce the narrowings through lifestyle changes or with bypass surgery or angioplasty and stenting may be needed. But that is not always the case. "A person may have extensive coronary artery disease, but still have adequate blood supply to the heart muscle during exercise," says Dr. Di Carli. "Neverthless, improving blood flow through their coronary arteries may prevent future problems. The gold standard for this purpose is an angiogram taken during cardiac catheterization, an invasive test. A noninvasive alternative is an angiogram taken with an enhanced form of x-ray called computed tomography (CT). CT angiography is now used in many emergency departments to quickly rule out coronary artery disease in patients admitted with chest pain. "A negative CT angiogram essentially excludes the presence of any significant disease and implies an extremely low risk of future heart attack," says Dr. Blankstein. 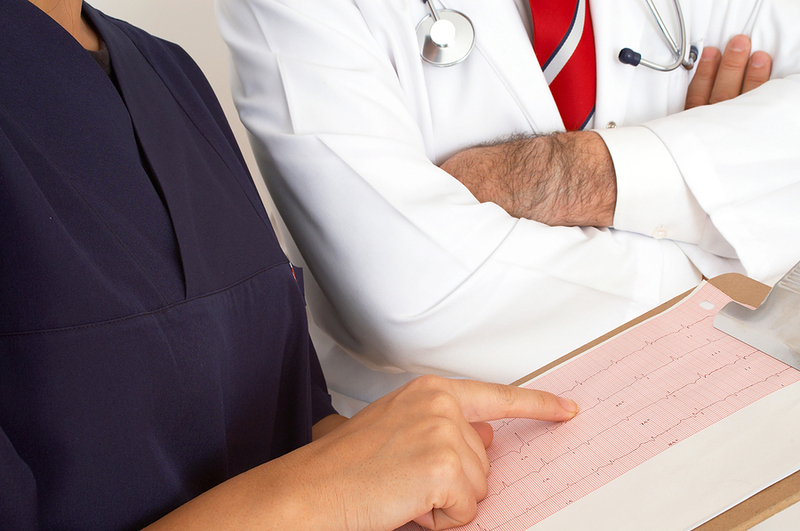 Cardiologists react with more concern when a large amount of the heart is in jeopardy. "Detecting a certain amount of heart muscle being starved of blood flow can help predict when revascularization is likely to improve symptoms and outcome," Dr. Di Carli explains. Even after a stress test and angiogram are performed, it is often not clear whether a blocked blood vessel is causing a problem. More testing might be needed. However, some heart attack-causing plaques narrow an artery by only 30% to 40% and cause no symptoms until they suddenly rupture, causing a heart attack. Finding a way to identify lesions prone to rupture could save countless lives. Although many companies and investigators are trying to find ways to predict the most dangerous lesions, no one has yet shown that this will be able to prevent heart attacks. What heart tests show blockage? Echocardiogram. Before and after a person walks on a treadmill, a small device is placed against the chest. It emits ultrasound waves, which bounce off the heart and produce a moving image of the beating heart and its valves. Nuclear perfusion studies. At rest and after exercise, a radioactive substance is injected into the veins and travels to the heart. This substance enables images taken with a camera to show areas of abnormal blood flow to the heart muscle caused by narrowings or blockages in the arteries, as well as scarred areas from prior heart attack. Magnetic resonance imaging (MRI). The person lies inside an MRI machine. Images are taken at rest and after a medicine is given to increase blood flow to the heart. The images can show areas of scarring and how well different parts of the heart contract.